New Hand Carved Cuckoo Clock Deer - Choose from 2 Types! Mode: silent. It doesn't affect usage. Ideal choice for DIY. Suitable for clock panel with a thickness not more than 4 mm. 2 The installation of pointers is skillful. Otherwise it will affect the performance that these pointers may not walk. Spindle Size: 10mm long. Great for repairing, replacing or making a clock. You can follow below process to chontact us. Quantity: 1 set. Hour hand size: 80mm(approx). Minute hand size: 103mm(approx). Spindle size: 13mm. Mode: silent. It doesn't affect usage. Suitable for clock panel with a thickness not more than 4 mm. 2 The installation of pointers is skillful. Otherwise it will affect the performance that these pointers may not walk. Requires a single AA battery to provide over a year if use. Battery Life 1 Year . Hour Hand Length 35mm. Battery Size AA (1x). Crystal Oscillator 32.758kHz. Accuracy /- 30Sec Per Month. Body Size 55 x 55 x 16mm. New Cuckoo Clock Bellow Bag Replacement Paper - Choose From 6 Sizes! New Clock Clicks, Formed Springs & Rivets - Ansonia, Gilbert, Seth Thomas, etc! Great for repairing, replacing or making a clock. Ideal for replacing defective units or for creating your own personalized clock projects. 1 x Fixing Nut. Note:Light shooting and different displays may cause the color of the item in the picture a little different from the real thing. Mode: Silent Mode. Great for repairing, replacing or making a clock. Shaft length: 5 mm / 0.19". Hour hand length: 56mm / 2.2". Minute hand length: 75 mm / 2.95". Second hand length: 118 mm / 4.64". 10 X Hour hand. New German Made Wood Cuckoo Clock Case Deer Antler- Choose from 4 Sizes! Great for repairing, replacing or making a clock. Quiet silent mode. Note:Light shooting and different displays may cause the color of the item in the picture a little different from the real thing. New German Made Plastic Cuckoo Clock Deer Antlers - Choose A Size! 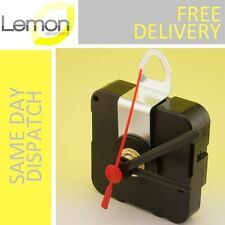 Replacement Quartz Clock Pendulum Movement Mechanism Motor Kit 12mm Shaft !! We will try our best to reduce the risk of the custom duties. Size: Approx. 5.5 x 11cm/2.17 x 4.33". Great for repairing, replacing or making a clock. Thread length: Approx 8 mm /0.32". Note:Light shooting and different displays may cause the color of the item in the picture a little different from the real thing. Suitable for clock faces up to 6mm thick. We'd like to settle any problem in a friendly manner. Great for repairing, replacing or making a clock. Hour, minute and second hands: gold. 1 x Fittings kit. New Clock Clicks and Rivets with Wires - 3 Left, 3 Right - Choose from 2 Sizes! New German Made Wood Cuckoo Clock Case Deer Crown - Choose from 4 Sizes! 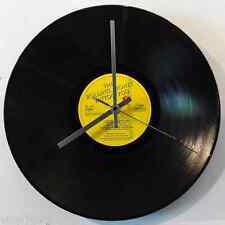 Everything you need to turn a 12" vinyl record into a clock (Beatles record not supplied, shown in photo for illustration only). Also includes AA battery. Everything you need to turn a 12" vinyl record into a clock. Also includes AA battery. Turn 12" vinyl record into a clock. New German Made Wood Cuckoo Clock Case Deer Head - Choose from 5 Sizes! Ideal for replacing defective units or for creating your own personalized clock projects. Energy efficient. Hour Hand Length: 50mm. Crystal Oscillator: 32.758kHz. Accuracy:± 30Sec Per Month. Body Size : 80 x 55 x 18 mm. A quartz crystal controlled clock movements with hour, minute and second handsIdeal for replacing defective units or for creating your own personalized clock projectsGreat for repairing, replacing or making a clockThe time is easily set or adjusted with the dial on the back of the unitPower Supply: 1 x AA Battery (Not included)Body Size: Approx. 55x55x16mm/ 2.17x2.17x0.63"Hour Hand Length: Approx. 65mm/ 2.56"Minute Hand Length: Approx. 90mm/ 3.54"Second Hand Length: Approx. 123mm/ 4.84"Package Included:1 x Quartz Clock Movement Mechanism Module1 x Hour Hand1 x Minute Hand1 x Second Hand1 x Washer1 x Fixing NutNote:Light shooting and different displays may cause the color of the item in the picture a little different from the real thing. The measurement allow. Whole Length Hour Hand: about 60mm. Minute Hand: about 75mm. Seconds Hand: about 100mm. 5 x Seconds Hands. 5 x Minute Hands. 5 x Hour Hands. Instruction is not included. 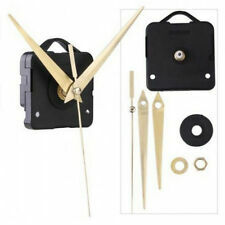 Vinyl Guru Kit includes all you need to make a 7 inch Single Record Clock. Everything you need to turn a 7" vinyl single into a clock. Also includes AA battery and Stand. Turn 7" vinyl single into a clock. Suitable for clock faces up to 6mm thick. Great for repairing, replacing or making a clock. 1 x Fittings kit. Hour, minute and second hands: gold. Hour hand length: 75 mm. Minute hand length: 104 mm. Second hand length: 136 mm. We'd like to settle any problem in a friendly manner. Suitable for clock faces up to 6mm thick. Great for repairing, replacing or making a clock. Hour, minute and second hands: gold. 1 x Fittings kit. It doesn't affect usage. Suitable for clock panel with a thickness not more than 4 mm. Mode: silent. 2 The installation of pointers is skillful. Otherwise it will affect the performance that these pointers may not walk. Great for repairing, replacing or making a clock. GBP 0.99 23 sold. You can follow below process to chontact us. Quantity: 1 set. Hour hand size: 80mm(approx). Minute hand size: 103mm(approx). Second hand size: 129mm(approx). Spindle Size: 10mm long. Great for repairing, replacing or making a clock. Quantity: 1 set. Hour hand size: 80mm(approx). Minute hand size: 103mm(approx). Second hand size: 129mm(approx). GBP 1.29 78 sold. Spindle Size: 10mm long. Great for repairing, replacing or making a clock. Quantity: 1 set. Hour hand size: 80mm(approx). Minute hand size: 103mm(approx). Second hand size: 129mm(approx). GBP 1.29 113 sold. Colour: Gloss Black. Whole Length Hour Hand: about 60mm. Minute Hand: about 75mm. Seconds Hand: about 100mm. 1 x Hour Hand. 1 x Minute Hand. 1 x Seconds Hand. Note: Light shooting and different displays may cause the color of the item in the picture a little different from the real thing. Motor Size: Approx. Crystal Frequency: 32.768KHz. 1 x Fittings Kit. Continuous, smooth sweep motion removes any ticking noise. - Total shaft length approx. - Center of hole hand size: hour hand is approx.65 mm; Minute hand is approx. 108mm Second is approx. 3 Pieces Hands(Hour/Minute/Second hands). Spindle Size: 10mm long. Great for repairing, replacing or making a clock. You can follow below process to chontact us. GBP 1.26 70 sold. Quantity: 1 set. Hour hand size: 80mm(approx). Minute hand size: 103mm(approx). New Complete German Cuckoo Clock Bellow Sets - Choose from 14 Sizes or Styles! Mode: silent. Ideal choice for DIY. It doesn't affect usage. Suitable for clock panel with a thickness not more than 4 mm. 2 The installation of pointers is skillful. Otherwise it will affect the performance that these pointers may not walk. New German Cuckoo Clock Case Replacement Water Wheel - Choose from 2 Sizes! Ideal choice for DIY. It doesn't affect usage. Suitable for clock panel with a thickness not more than 4 mm. Mode: silent. 2 The installation of pointers is skillful. Otherwise it will affect the performance that these pointers may not walk.